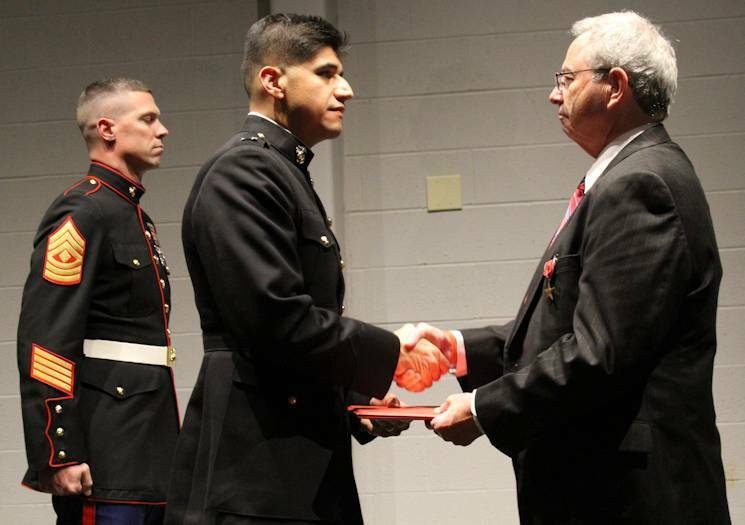 COLUMBUS, Ohio - On Dec. 13, 2013 in front of friends, family and fellow Marines from Company L, 3rd Battalion, 25th Marine Regiment, former Marine Cpl. Tim Padgett was awarded the Bronze Star Medal with Combat "V" device at the Marine Corps Reserve Center in Columbus, Ohio, for actions during the Vietnam War. According to his citation, then 22-year-old New Lexington, Ohio native Cpl. Padgett, who was a squad leader with Co. D, 1st Bn., 7th Marines, was leading his rifle squad on a patrol April 26, 1967, when they were ambushed by a superior enemy force. The initial volley of fire wounded the point man. The squad corpsman, Theodore Knox, attempted to render aid to the point man and was then also wounded by enemy fire. After deploying his squad to engage with the enemy, Padgett, while under enemy fire, ran forward to retrieve the wounded Knox. With the assistance of another Marine, Padgett was able to carry Knox to a waiting helicopter where he then received lifesaving medical treatment. Afterwards, Padgett's squad managed to resist the enemy long enough for reinforcements to arrive. Padgett never received an award for his actions that day. The subject of an award never came up again until 2003 when the company had their first reunion. At that point, Padgett and Knox had not met since 1967; in fact Padgett did not even know that Knox had survived that day. During one of the annual reunions, Knox found out that Padgett never received an award for his actions that day and took it upon himself to rectify the mistake. Knox began gathering witnesses and documentation needed to make a case for an award. Over the course of four years the award package eventually made its way to the Secretary of the Navy, who approved the award for Padgett on Oct. 1, 2013. After the ceremony, the now 67-year old Padgett expressed his feelings on receiving the award. Knox, who dedicated much time and effort to ensure Padgett was properly awarded, was glad to see his efforts pay off.